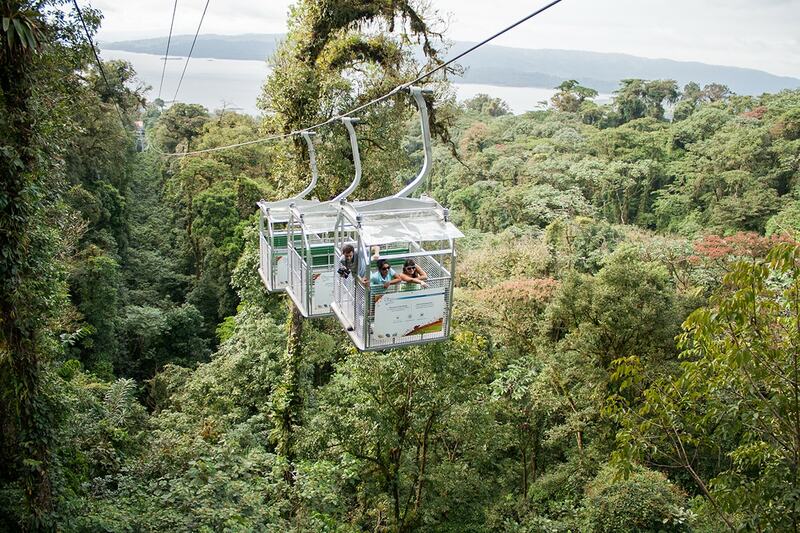 The Sky Tram gondolas rise smoothly through the Rain Forest, offering up endless views during their mountainous ascent. This tour is perfect for people who want to take a different approach on admiring nature, without much physical effort but still be on spot where natures exhibits all its magic. On tour, you will be attended by a bilingual guide who will point out distinctive characteristics of the flora and fauna and other interesting facts of the area. Our Sky Tram travels up the mountains to arrive to a wide observation platform on the highest point of the reserve, where you can enjoy the breathtaking views of the Arenal Volcano, Lake, and the surrounding forests. The duration of the tram takes about 20 minutes before arriving to the observatory deck, people just taking this tour will descend back in the tramway. During this ride, you will have the opportunity to learn about the wildlife of the canopy and if with luck spot out monkeys, birds, sloths and curious plants and trees. Complete tour takes around 1 hour.